As we gallop towards Valentine’s Day we thought it a fitting time to focus on some romantic holiday ideas. Whether it’s a honeymoon you are deliberating or simply a romantic escape to celebrate a special milestone, you’ll find plenty of inspiration here at Real Africa. 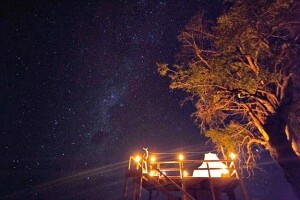 Undeniably romantic, Africa offers starry skies, wonderful candle-lit camps and incredible barefoot beach retreats. Add to that a bounty of wildlife and culture and you have the perfect romantic escape. Many of the lodges and camps we use in Botswana are small varying from 4 tents (Zarafa) to a dozen or so in the Delta and even in Chobe National Park, our preferred lodge, Muchenje, is hidden away in the quiet Forest Reserve in the west, on an escarpment overlooking the Chobe River and far from the crowds associated with Kasane. There are only 11 chalets, all with private decks and wonderful views over Chobe. Chobe is an excellent option if you want to experience the natural wonders of Botswana but are on a tighter budget. You can combine Victoria Falls with a side-trip to Botswana’s Chobe National Park for a safari, which can easily be accessed on tarred roads from The Falls. This makes a great week long itinerary, and a stay at The Falls is romantic in itself. Chobe is impressive – it has the densest concentration of wildlife in Africa and is famous for its huge herds of elephants. To see a sample itinerary click here. Another way to experience Botswana on a budget is to travel out of the peak season which runs from April to October. There is a safari special called Five Rivers which we get every winter and is offered on our newsletter and website for travel Nov to March – it always fills up within a week or so. There are also a number of lodges owned and managed by the same company which can be combined to make a cost effective itineraries – these include Ker & Downey, Kwando, Footsteps Across the Delta and Desert & Delta among others. 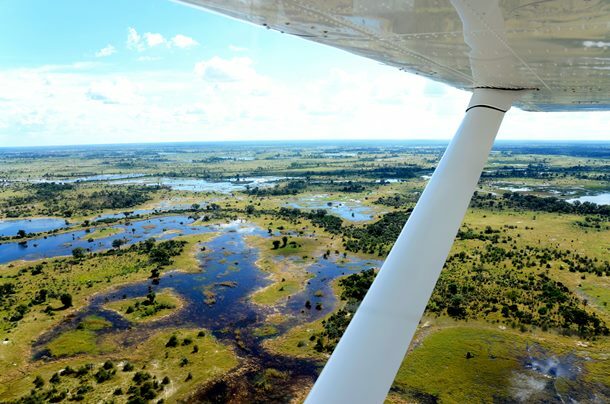 But if you really crave isolation, then it has to be Duba Plains (pictured above) on the western side of the Okavango Delta, reputed to be the very best place to observe lion, and said to be Botswana’s most remote camp amidst a 77,000 acre reserve. 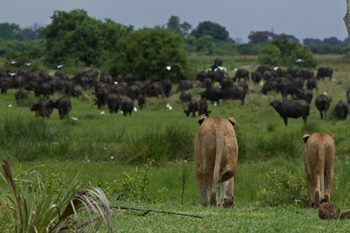 Before last year there was a very large pride and you could often see lion and buffalo going head to head. The camp advise us that the lion pride has now splintered so although you have a good chance of seeing big cats the real joy at Duba Plains is being at a traditional rustic tented camp in a remote and very beautiful part of the Delta with guides that really know their stuff. That’s what you pay for. Mombo Camp, and Little Mombo (possibly Botswana’s most expensive camp) sit on Mombo Island on the northern tip of Chiefs Island in the Delta. This offers the best all year round game viewing. There are only 9 tents at Mombo (plus another 3 at Little Mombo). You’ll see big herds of game as well as an excellent chance of observing big cats – there are 7 prides of lion in the area. Honeymoon idea: embrace adventure and join the Selinda Canoe Trail, exploring remote waterways and fly-camping on deserted islands beneath the stars. Combines brilliantly with a couple of nights in a luxurious lodge in the Delta. Yes, Zimbabwe is back on the holiday map and feedback from our senior consultant Lily who was there last year is that it promises a sensational trip for those with the time and budget. The infrastructure and distances involved means that most areas are best accessed by light aircraft, and the camps are certainly pricey due to their remote nature, but having said that, some have already established a reputation for superb guiding and warm hospitality. Mana Pools is considered a real gem in southern Africa. You can explore by 4×4, by boat on the Zambezi and also walking. Please do ask to speak to Lily if Zimbabwe is of interest. You can see some sample itineraries and lodges here. 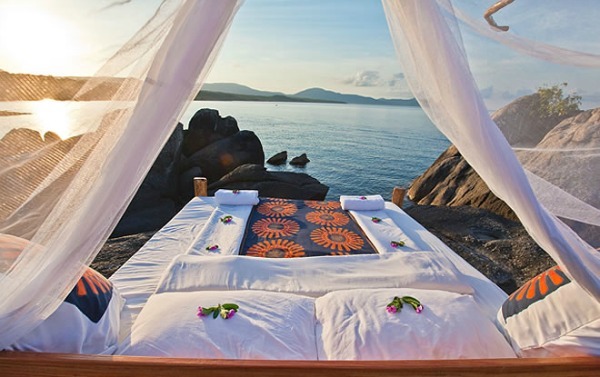 Honeymoon idea: Looking for a once in a lifetime experience? Consider Singita Pamushana, part of our Ultimate Collection. Zambia – camping – but not as you know it! For those who want a pristine environment then staying at a mobile camp in Zambia’s South Luangwa is as close as you can get. The camps are taken down at the end of the dry season in October leaving very little impact on the environment and put up again in April/May time. 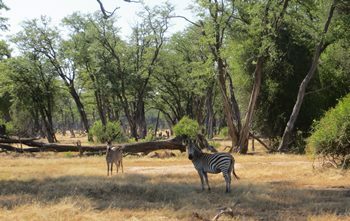 Sightings of wildlife in and around camp are excellent and these mobile camps naturally have a different feel to them. Camps can be combined in a safari circuit – each one is different in its outlook and construction so they combine really well. You can even enjoy bush walks between them. We all have our favourites camps but tend to use Robin Pope and Norman Carr properties for most of our clients. You can find out more here. Honeymoon idea: enjoy the thrill of a big game safari in Zambia’s South Luangwa and then crash out on the shores of beautiful Lake Malawi for lazy days in the sun. See our Valley & Lake itinerary here. Being partial to boats, being barefoot, water and islands the Ibo Island Dhow Safari is right up there on my wish list. If you like your holiday to have a balance of activity and downtime then this combination of dhow and lodge safari could be perfect for you. 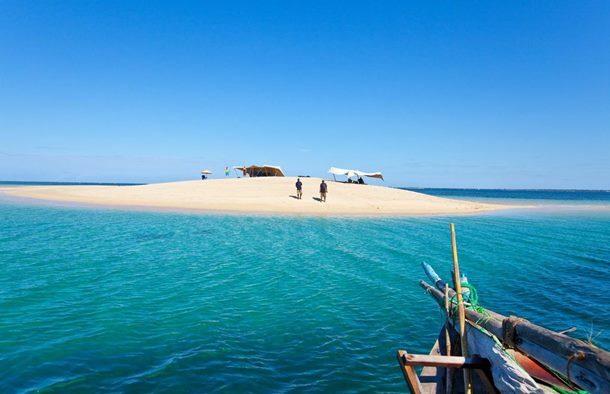 Ibo Island lies in the incredibly beautiful Quirimbas Archipelago in Mozambique. The crystal clear waters lap sun-drenched white sand beaches. Beautiful coral reefs teem with life from turtles and rays to spectacular reef fish such as parrotfish, groupers and batfish. Common, bottlenose and spinner dolphins can also be seen while humpback whale sightings are good between June and December. Turtle nesting generally occurs on beaches between October and February. 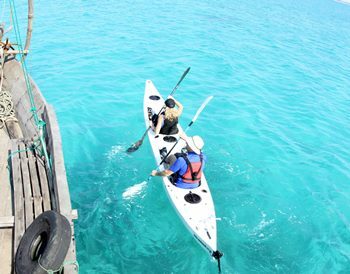 This 7 night module ex Pemba includes 4 nights island hopping and 3 nights at Ibo Island lodge itself. You island hop on a traditional Arab 12 metre dhow looked after by a Mozambican skipper, crew and chef. The dhow has been modernised and has an engine as well as sails giving lots of flexibility. You don’t sleep on board but camp ashore in some wonderful deserted spots. Days are spent barefoot, exploring by kayak, swimming, snorkelling and sailing and by night you star gaze and cosy up by the camp fire to feast on freshly caught seafood prepared by the chef. The crayfish comes highly recommended! Ibo is one of 32 islands in the archipelago so there is no shortage of beautiful beaches and sand banks to explore.Camping ashore involves comfortable 2 person 3x3m walk-in dome tents with safari style stretcher bed with 2 in memory foam mattress and insect screen. Mobile eco camp bathrooms are set up for you, with traditional bucket showers and bush loo. Ibo Island Lodge won the Best Marine Safari Property Award in the 2014 Safari Awards. The lodge itself, where you spend the final 3 nights, comprises three historic 150 year old mansions which have all been lovingly restored to their former glory. The luxury lodge sits in lush gardens with a pool. 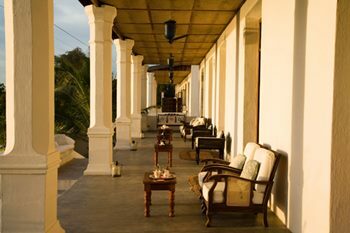 Each of the ensuite air-conditioned 14 rooms have been individually designed and enjoy wide airy verandahs to soak up the ocean views. The roof top restaurant is a wonderful place to enjoy a sundowner and watch the sun set. The island, which was an important trading post and which our senior consultant Lily has been lucky enough to explore is a real fairytale destination with a 200 year old historic town, 16th century fort, crumbling ruins, wonderful architecture and small communities. The island’s interesting history as a result of being split between Portuguese and Omani-Arab rule for several centuries means there are many interesting forts and buildings amidst the fig trees and bourgainvillea to explore. You can join scheduled departures with a maximum of 7-10 guests. There are also private departures (please ask) so as well as appealing to groups of friends and families, this is a great option for a honeymoon or romantic break. You can choose to lose yourself amidst a group or set sail exclusively. You can see a day to day itinerary and find out more here. Honeymoon idea: this 7 night dhow and lodge safari works brilliantly well when paired with South Africa since flights to Pemba naturally route via Johannesburg – depending on how much time you have, you could add a 4×4 safari in South Africa’s Kruger National Park, staying in a beautiful tented camp like Honeyguide Mantobeni. The best time to safari in Kruger is during the dry winter months between May and November – and this is also the optimum time to be island hopping in Mozambique. There are many wonderful properties in Mozambique, some can be accessed more readily than others, for example Machangulo and White Pearl. Please do ask us for details.See a sample South Africa and Mozambique itinerary here. Kenya – the quest to get off the beaten track! 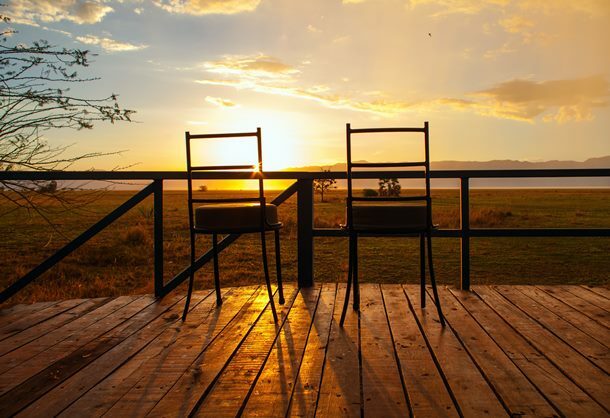 Alex Walker’s Serian sits in the private Mara North Conservancy, bordering the famous Masai Mara National Park. For a stylish safari which embraces authentic Africa then Serian is a superb choice. Many of our clients combine Serian with either Borana on the Laikipia Plateau and/or Saruni Samburu further north – both fabulous and very much off the beaten track. Our In Style sample itinerary combines Tortilis Camp in Amboseli with Borana in Lewa Downs and Serian in the Mara and can of course be adapted to suit you. We also offer a week in the Mara for those who don’t want to move around too much and for whom the primary focus is wildlife. You can combine Alex Walker’s Ngare Serian camp with the Nkorombo mobile camp and a night in the ‘Nest’ – a treehouse overlooking the river – a fabulous safari combination. Serian also employs local Masai guides which enhances your experience with a cultural element. See a sample itinerary here. 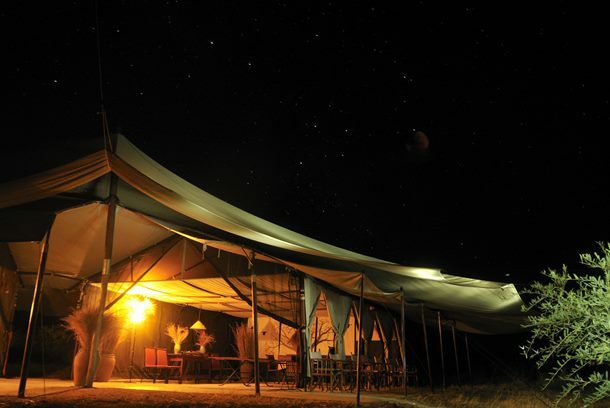 Ngare Serian is a permanent camp set up on the Mara River with just six specious marquee guest tents on hardwood decks. You access the lodge by a rope bridge. The Nest suspended in an Elephant Pepper tree, is a treehouse over a salt lick on the Mara River, which you can walk to, guided by a Masai guide. 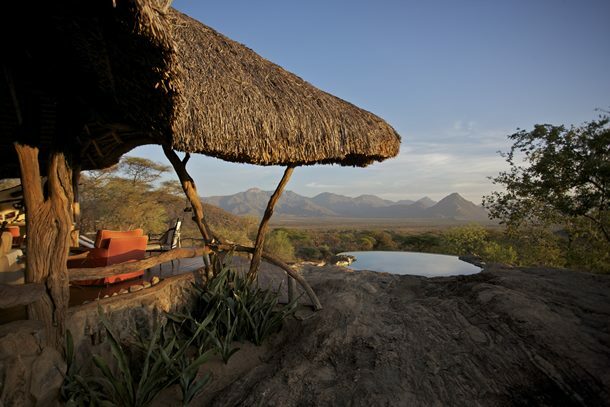 The Masai keep watch from a distance while you enjoy fairytale privacy, game viewing, supper and a night under the stars. 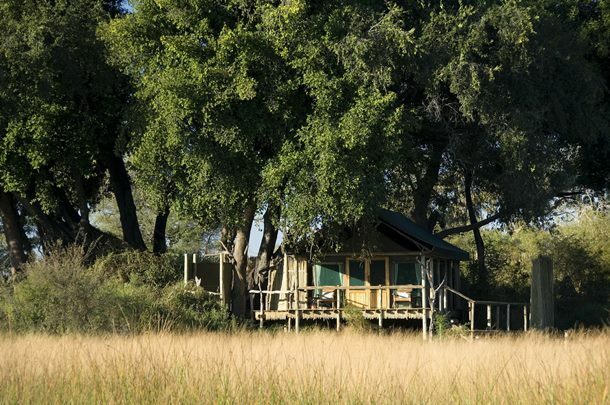 The treehouse is equipped with night vision camera, safari bathroom and a very comfortable nest for two. The Nkorombo mobile camp offers a different experience again, with just 5 traditional Meru style tents with ensuite facilities consisting of a bucket safari shower and flush loo. The salt lick harbours a variety of wildlife including black rhino, leopard and lion and gets you really close to the action. 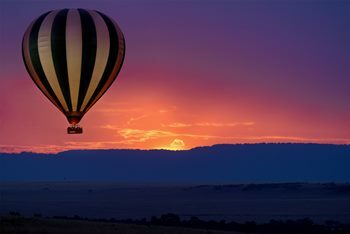 Honeymoon idea: ask us about pre-booking a dawn hot air balloon flight over the Masai Mara, settling back down on the plains after an hour’s flight to a champagne bush breakfast. 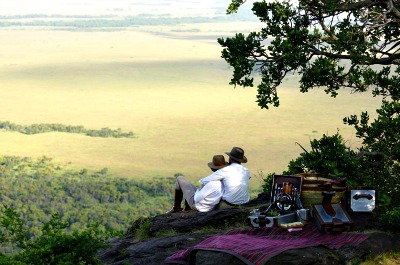 There are more economical options in the private concessions bordering the Masai Mara. Karen Blixen Tented Camp sits on the banks of the river with 26 ensuite tents for example. You get all the benefits of being in a private concession but can keep costs down by staying at a slightly larger camp. Very few visitors to Kenya get to explore the north – both Samburu and the Mathews Range offer a fantastic experience and wonderful options for you. These areas offer a different more arid landscape, the Samburu people and their culture and a stay here combines perfectly with the big game of the Mara. Sarara Camp is our most northerly camp and really embodies off the beaten track. For a first time in Africa then Tanzania’s Northern Circuit is hard to beat, giving you that dense concentration of animals, diverse landscapes and a superb choice of camps and lodges. But if you long to get off the beaten track and to see a quieter Africa then the Southern Parks of Selous and Ruaha can reap real rewards. We recommend you spend longer in each destination, 4 nights is a good amount of time in each park, as the wildlife is certainly more challenging and unpredictable being spread out over a vast area. The best wildlife viewing is usually during the dry months of May to November time when wildlife concentrates around the water sources. Ruaha is actually Tanzania’s largest national park. The mighty Ruaha River snakes along the southern border, with baobabs and floodplains fanning out from the river. You also have rolling hills. You fly into Ruaha from Dar es Salaam, a 3 hour flights, and then enjoy game drives from the camp/lodge you are staying at which can normally be accessed within an hour of the airstrip. This gives you an idea of the remote nature of the camps. In Ruaha, if you really want to embrace the wild and remote nature of Ruaha, we recommend the small mobile tented camp, Kwihala by the Mwagusi Sand River. With just 6 tents Kwihala combines understated luxury in a very wild and beautiful environment. You have lots of comfort and a high level of service but its not flash or over the top. Tents have ensuite bathrooms with safari bucket showers (hot water!) and flush loo. Part of Asilia Camps, Kwihala gets incredible feedback with guiding at an exceptional level. You are unlikely to come across other safari vehicles and the area feels truly untamed. You can explore on foot, and enjoy game drives by day and night. This sort of rare environment does come at a price but you really do have a special experience. 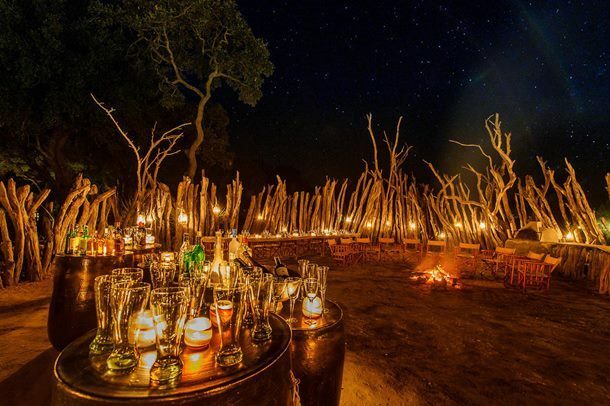 If you prefer something more permanent and slightly less wild feeling, then the long established and more affordable Ruaha River Camp, run by the Fox family, would be our recommendation. It was the first camp in the park and gives you a very personal service even though perhaps looking slightly dated these days. There are 20+ individual stone and thatch riverside Bandas set over a hillside looking out over the Great Ruaha River and linked by two central mess areas. The bedroom and bathroom are really spacious. The Foxes’ children were raised here and so they are geared up for family stays. The location is really good with wildlife attracted to the river and it is not uncommon to find elephants strolling amidst the camp. Ruaha River Camp tends to be a more realistic option for many of our clients seeking the remote reaches of the southern parks but not wishing to completely blow the budget. You can fly from Ruaha to the Selous, Tanzania’s other southern star. Selous Game Reserve is twice the size of the Serengeti with the Rufiji River at its heart and creating a network of swamps and channels. Virtually all of the lodges are in the northern tip of the reserve. We tend to use Rufiji River Camp, just inside the gate and again the original camp built by the Fox family, because of its superb location right on the river. You can explore by 4×4 here and by boat, a wonderful option. The camp is smaller than the one in Ruaha with just a dozen or so tents strung along the river bank with great views. We also offer one of the newer lodges in the Selous, Azura Selous, formerly known as Amara Selous when it opened in 2010. There are only 8 tented rooms and the feel is smart and sophisticated. The location on the river is good although the camp is situated further west than the Rufiji Camp which is in the plum position for the densest wildlife. We know that Azura are keen to make Azura Selous a real beacon for expert guiding and hospitality and we look forward to seeing how they develop the camp. The manager is a keen photographer and knows where to go when! See a sample southern Tanzania itinerary here. Just as the Southern parks are less explored than the Northern parks, so is the southern coast and islands. Zanzibar attracts the vast majority of visitors attracted by the Spice Islands lush interior, atmospheric Stone Town with its magical architecture and markets. Very few people seem to make it to the quieter island of Pemba and Chumbe, both reached via Zanzibar but a very different prospec, or to the wondrous beaches and islands further south and accessible from Dar es Salaam. Lazy Lagoon is a beach resort set on Bagamoyo island in the Zanzibar Channel around 80 km north from Dar . You reach the island by boat. It hit the headlines when Boris Johnson holidayed here and subsequently floated out into the Indian Ocean on his lilo! There are only 12 private beach bungalows or bandas with thatched roofs right on the beach with super ocean views – a great place to unwind. 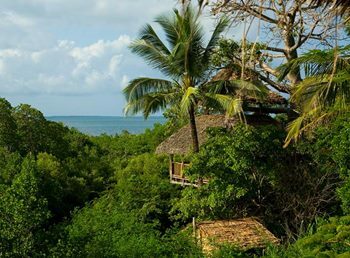 While the alternative Mafia Island is accessed by a flight from Dar and is the Africa of old with sandy streets, overgrown ruins, few visitors and surrounded by a sensational marine reserve. We are fans of the laid back and rustic tree houses at Chole Mjini, or for more traditional comforts, Pole Pole. Many people forget that you can enjoy white sand beaches lapped by the Indian Ocean at exceptionally good value by heading to the beaches south of Dar. This maximises holiday time by cutting out long journeys and makes great use of your budget. We love Protea Amani Beach and Ras Kutani. 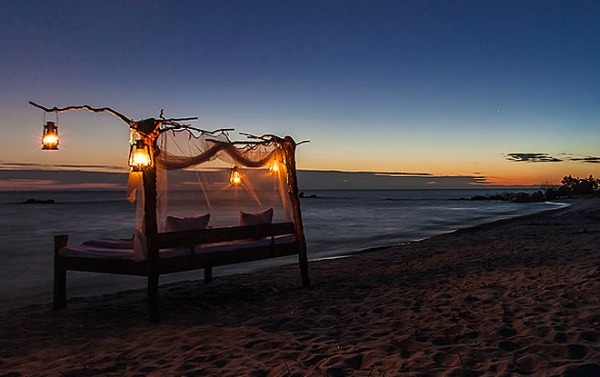 Honeymoon idea: explore Pemba and enjoy the best of barefoot luxury with a stay at Fundu Lagoon. The small and laid back island of Pemba is Zanzibar’s sleepy and very beautiful neighbour. 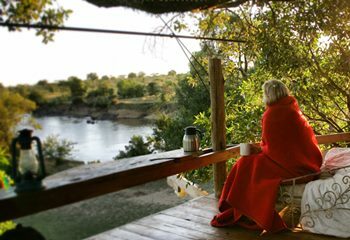 South Africa offers a myriad romantic choices suitable for all levels of budget – from small guesthouses with individually styled rooms and lush gardens in the heart of the Cape winelands (we like Wedgeview and Akademie Street) to cool tented camps in Kruger, like Honeyguide Mantobeni. 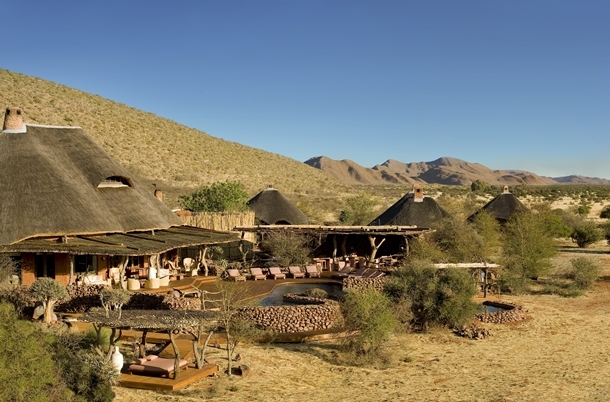 Honeymoon idea: combine the Kalahari with the Cape for a week of pure luxury. See sample itinerary here. The number one question at travel shows from prospective clients looking at honeymoon options is: will it be busy? In answer, it depends very much on your budget and the season you wish to travel. Africa has plenty of places where you can escape the crowds; the most exclusive destinations being Botswana, Zambia and Zimbabwe. Here you can really relish space. Camps are small, with only half a dozen or so tents, and are located in remote and vast wild areas which need to be accessed by a light aircraft more often than not. The emphasis is on the quality of experience with guiding exceptional. If you are happy to travel out of peak season you can look forward to a real treat. The rains in Africa are often referred to as the Green or Emerald Season and although you can expect thundery showers every afternoon (perfect siesta time…) you can also expect to see wonderful dramatic skies, nursery herds, with many of the animals having calves and pups at this time of year , and a lush landscape with flowers on the plains and trees in fruit. To get a flavour of the Green Season check out this new’s post on Zambia. Even in the world-famous Masai Mara in Kenya, it is possible to find hidden gems – there are private concessions surrounding the main national park where visitor numbers are strictly monitored. These concessions, which you fly-in to, have a handful of small secluded camps tucked away along a river’s edge or in a quiet grove, like Alex Walker’s Serian. In the Mara North Conservancy for example, there is a ratio of just 1 guest to 350 acres allowing the camps here to offer a premium safari experience and a chance to escape the crowds associated with certain times of year in the main national park where larger lodges operate at maximum capacity. We would urge you to be realistic in your expectations and to discuss your requirements fully with us so we can advise accordingly – if you are heading to East Africa to witness the Great Wildebeest Migration then do not expect to be alone! Please note: all of the suggestions made here can be tailored to suit you and to make a complete itinerary including flights from the UK. To find out more about any of the properties or holiday ideas here please call us on 01603 283 517. Because many of the camps and lodges detailed are very small, the most important thing is to contact us as early as you can in order to avoid disappointment!